The spacecraft is in the midst of intense environmental testing at NASA’s Goddard Space Flight Center in Greenbelt, Maryland, in preparation for its journey to the Sun. These tests have simulated the noise and shaking the spacecraft will experience during its launch from Cape Canaveral, Florida, scheduled for July 31, 2018. “This illumination testing verifies that each ‘string’ of solar cells on the array remains electrically connected to the spacecraft after vibration and acoustic testing,” explained solar array lead engineer Ed Gaddy of the Johns Hopkins Applied Physics Lab (APL) in Laurel, Maryland. APL is building and will operate the spacecraft for NASA. To make sure that the 44 strings (a series of connected solar cells) on each panel are still well-connected after environmental tests, each string was illuminated individually to ensure that it would still create electricity and transfer it to the spacecraft. Lasers are ideal for this kind of testing, because their narrow beam allows the team to illuminate just one string at a time. The strikingly colored lasers were selected because they were readily available and because the solar cells operate efficiently at that color. But by themselves, these visible lasers are insufficient to power the solar cells, so the team also used infrared lasers for this test. Infrared light is not visible to our eyes as wasn’t captured in these images. Laser illumination testing of Parker Solar Probe's solar arrays at NASA Goddard Space Flight Center. 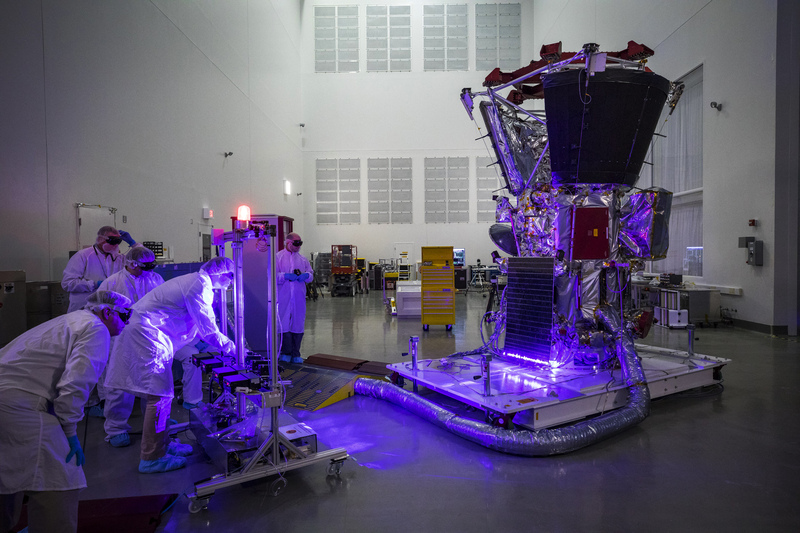 Parker Solar Probe team members use lasers to ensure that the spacecraft's solar arrays have survived harsh environmental testing and are operating correctly.